This November, our focus is on creating a log cabin feel using natural furnishings and fabrics to create a cosy and inviting atmosphere in your home. This style, partly incorporating the Scandinavian interior trend, focusses on bringing natural materials into your home, but in a sleek and minimal way, resulting in a modern yet homely feel. If installing wood effect flooring is a step too far, then consider using convincing wood effect wallpaper in timber or oak effects as a feature wall in your lounge. This will instantly revitalise your space, and when combined with our fire of the month (the Opti-myst Grand Rouge) gives all the ambiance of being in a warm log cabin, away from the cold, harsh winter weather. Floating shelves are great to keep a minimalistic theme, and using a wood effect that is different to the wallpaper will provide texture, depth and interest to the room. Accessorising this with your favourite books, candles and succulents breaks up the wood textures and adds moments of detail to your wall. You should also experiment with upcycling items that you wouldn’t usually consider, use a collection of wooden stumps to act as a centrepiece of coffee tables and utilise wooden crates as storage by nailing them to the wall or stacking them on their sides to use as a bookcase. 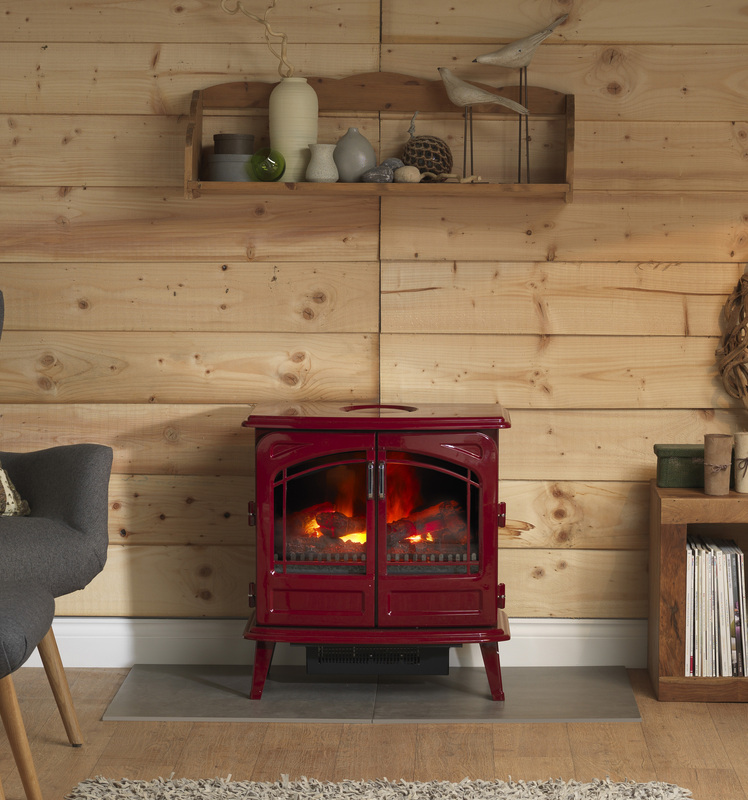 The rich red colour of the Grand Rouge Opti-myst stove, available exclusively at B&Q, enhances the warmth of the unique flame and smoke effect and adds instant comfort, ambiance and style to your room, perfectly complimenting the cosy cabin feel. Currently, we are offering £25 cashback on the Grand Rouge, and up to £75 on select other Opti-myst fires to offer you the chance to add maximum comfort to your home, for the best price.